Albertsons Companies Foundation announced the release of its 2017 Community Impact Report, which illustrates how money donated by Albertsons Companies customers helped effect meaningful change for the people who need it the most. The 2017 Community Impact Report reveals that Albertsons Companies Foundation gave $44.6 million to important causes in core areas of giving, including education, hunger relief, veterans support and health and human services. The funds were raised through in-store donation campaigns, including campaigns for cancer research and treatment, organizations that provide outreach to people with disabilities, and help for people impacted by Hurricanes Harvey and Irma and California’s wildfires. The annual Hunger Is campaign, a joint charitable program of Albertsons Companies Foundation and the Entertainment Industry Foundation, focuses on providing kids with healthy breakfasts, not only reached the $20 million mark in 2017, but it also earned two prestigious Halo Awards, North America’s highest honor for corporate social initiatives and cause marketing. 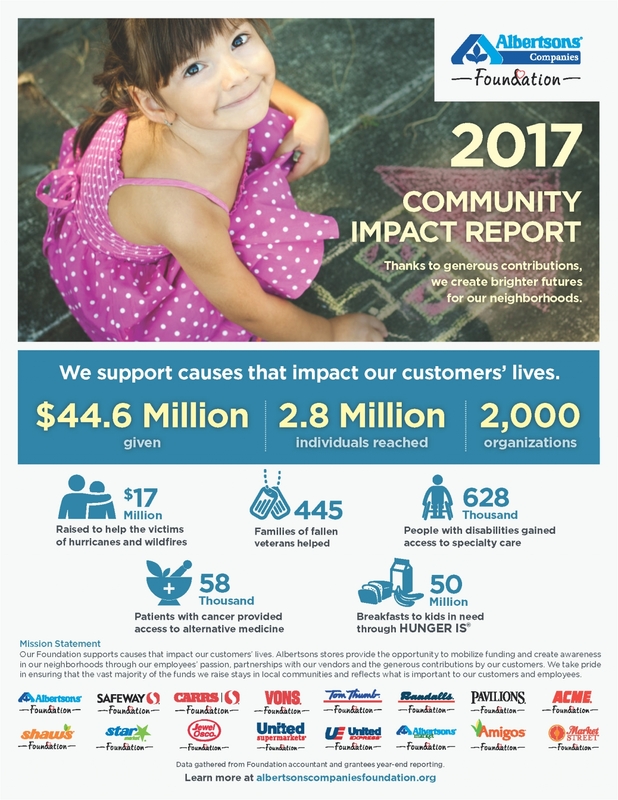 In total, the contributions from Albertsons Companies Foundation impacted 2.8 million people, including 628,000 people with disabilities who were able to gain access to specialty care and services and untold more who are still receiving assistance to recover and rebuild from natural disasters. Like store food donations, which benefit local food banks and pantries, money raised through in-store fundraisers remain local, supporting organizations that serve the community in which the funds were raised. To learn how donations are used to help your community, go to www.albertsonscompaniesfoundation.org and select your state, city and local store.